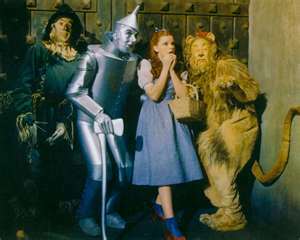 “The Wizard Of Oz” – not to be confused with The Wizard Of Menlo Park of course. After all, one was a movie musical with a series of limited but determine characters in not-so-subtle costuming, the other referenced Thomas Edison, thought by many to be one of the greatest Americans of all time. Given that scores and scores of books have been written about Edison, I think it is my duty to address the brilliant management and leadership lessons that one can learn from following a yellow brick road. 1 – There’s something to be said for being ‘the man behind the curtain’. The strongest leaders do not need to advertise their power, rather they advertise the talents of those around them. 2 – Mentors typically don’t make themselves known by descending from the sky in a transparent globe, holding a wand and wearing a crown. But they’re out there. 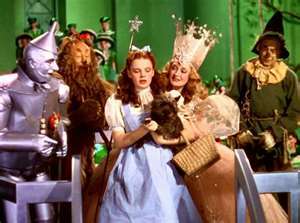 Mentors can be people within your organization who have successfully navigated its twisty, winding paths, know where the flying monkeys lurk, who have the magnetism and talent that people gravitate towards and/or have the technical expertise from which you can learn. They also may not be looking for you, so it would behoove you to seek them out. And parenthetically, it’s probably better if they don’t sing soprano with an insufferable vibrato. 3 – Some days you’re the house, other days the house falls on you. Either way, neither state is forever (unless you happen to be a wicked witch – and if you are, there’s probably better reading for you out there). 4 – The best teams are comprised of people with markedly different talents. It’s best not to duplicate areas of expertise, rather seek those who’s abilities will be complementary. Chances of effective project completion are highly increased, everyone emerges stronger and more well-versed than when they began and you can maintain a shared vision of the goal without introducing individual competitiveness. 5 – It’s good to carry a bottle of water around with you at all times. At the least, you’ll stay hydrated. 6 – The easiest way to achieve insurrection is encouraging people to follow you by dicta rather than by choice. Rest assured that your people will leave your side at the earliest opportunity if their contributions aren’t valued, their input ignored and their chances for professional exploration limited to a narrow, controlled orbit. 7 – Help your people realize their professional goals. Not only is it your job, it will enhance the talent stream, engender loyalty and infuse the work place with energy. 8 – Courage means different things to different people, but supporting your people as they break out of their comfort zones is an enriching experience for you and a thrilling new beginning for them. 9 – Show your heart – it only makes you appear stronger, more authentic and relatable. It will not diminish your authority at all. 10 – Work and home are inter-connected. They don’t exist in separate silos. It is impossible to separate the two when there are issues or concerns involving one or the other. It is far better to recognize this and determine the best way to reconcile the two rather than having them at war within you. 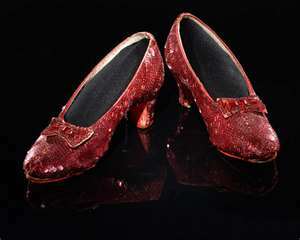 And finally, if you really feel you need to, invest in a pair of ruby slippers. They aren’t going to help you get anywhere, but they should appreciate greatly over time. Posted on March 21, 2012 by mimijk •	This entry was posted in humor, leadership, management, motivation, work life and tagged leadership. Bookmark the permalink. You inspire me with every word you write. I think maybe your truck picked me up for several miles along the yellow brick road a long time ago. Inspirational – an understatement. Brava! 1. I have always been a behind the curtain kind of leader. I don’t like the focus on me. It seems to work. 2. I am not sure one person can mentor you on everything that you need to know in life. You may need to get different pieces from different people. 3. Good to rememeber when things are bad, but even more important to remember when things are good. 4. Surround yourself with people that tend to disagree with you. It will yeild outstanding results. 5. Probably the most intelligent piece of adivce I have heard in a long time. 6. If your employees could vote whether to keep you or take their chances with a new unknown manager, which way do you think they would vote? Win their hearts and minds everryday. Do not take loyalty for granted. 7. This is a leader’s primary responsibility. If you do this, everything else will take care of itself. 8. It also encourages people to develop truly brilliant ideas. 9. All of the best leaders are emotionally invested in what they do. 10. I have way too much to say on this point. I think I may make it a topic for a post in the near future. Thanks you for the inspiration. Not sure why, but you post made me happy. So thanks. I know a person from my old facility who could have used a brain…terrific writing, as always! I agree with that person named Jo above—whoever she may be, in that you are inspirational. Hi – I think there’s a difference between showing your heart and being taken advantage of (and I can see how the line is thinly drawn). Showing your concern for the people on your time, investing in their professional growth, giving them feedback consistently, providing solid challenges, etc doesn’t mean you’re weakening your authority – you’re enhancing it. Call people on the behaviors that are unacceptable, ust as you would call them on their successes. As for the bottle – I notice you didn’t describe its contents – that’s ok with me..:-) Thanks for writing!